A Scientific and Spiritualistic Magazine Devoted to the Interests of Humanity / A Large, 8-page, Weekly Journal, Devoted to the Advocacy of Spiritualism in its Religious, Scientific and Humanitarian Aspects. 1/1, May 1877-1887. 8 pp., 12 x 18. $1.00 - $2.50, a year. 24 pp. "The Offering will be conducted independently, impartially. Nothing looking to man's welfare will be deemed alien to its pages. Unrestricted discussion of all questions of humanitarian import, will be ever maintained by it. Offensive personalities and indelicacy of language will be wholly excluded. In its editorial conduct, the truth. beauty and utility of Spiritualism in its higher phases will be advanced. It will not in any particular be a sectarian journal, but broad, progressive and liberal--will give fair and equal expression to all forms of thought; and 'fair field, and no favor' it extends to all. Above all things it aims to be Liberal, to be devoted to Liberalism in its broadest and most extensive application." No copy is known after August 1883, but the Carrier Dove for January 1887 notes the transfer of the journal to Chicago. Articles by W.E. 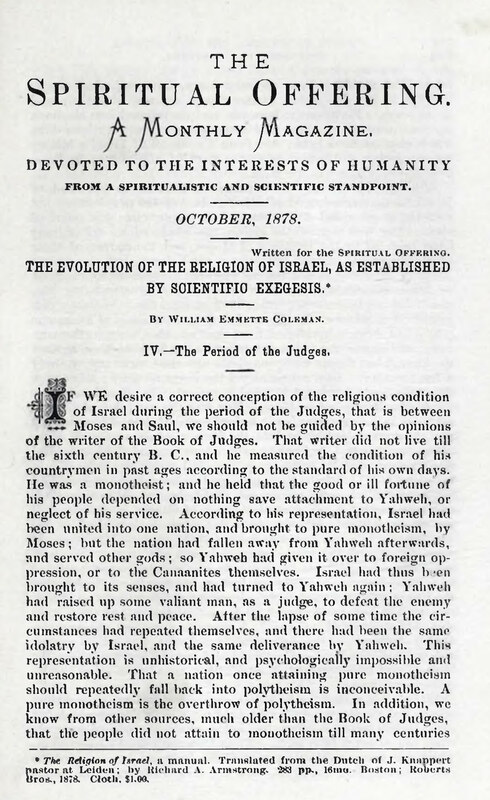 Coleman (who in 1878 conducted a regular "Review of Current Literature"), W.F. Jamieson, Henry Kiddle, Moses Hull, Thomas R. Hazard, and Cora L.V. Richmond. Col. John C. Bundy of the Religio-Philosophical Journal, in a letter to A.J. Davis on January 8, 1879, says that Col. Fox was "a thorough bred rascal and free lover and as such should not be again wormed into the good will of the people." He was not alone in this opinion. J.R. Francis, the editor and proprietor of The Progressive Thinker saw Col. Fox as his (unsuccessful) predecessor in trying to launch and sustain a spiritualist journal that sold for $1.00 a year. "That Poisoning Case," Progressive Thinker, March 7, 1896. At least in 1883, the journal was the organ of the Mississippi Valley Spiritualist Association and its camp meeting at Mt. Pleasant Park in Clinton, Iowa. Dartmouth College, Boston Athenaeum; Rochester Public Library.